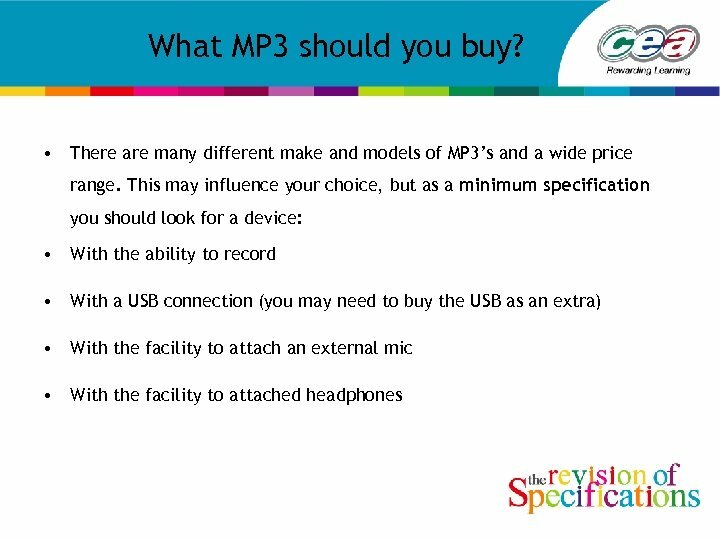 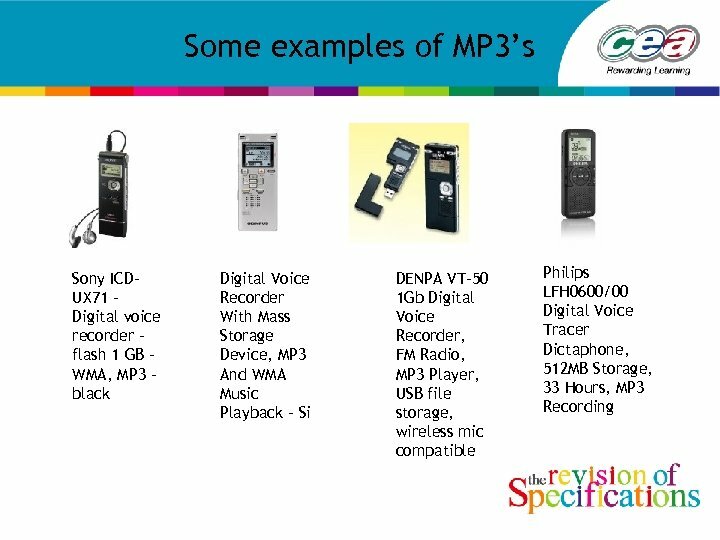 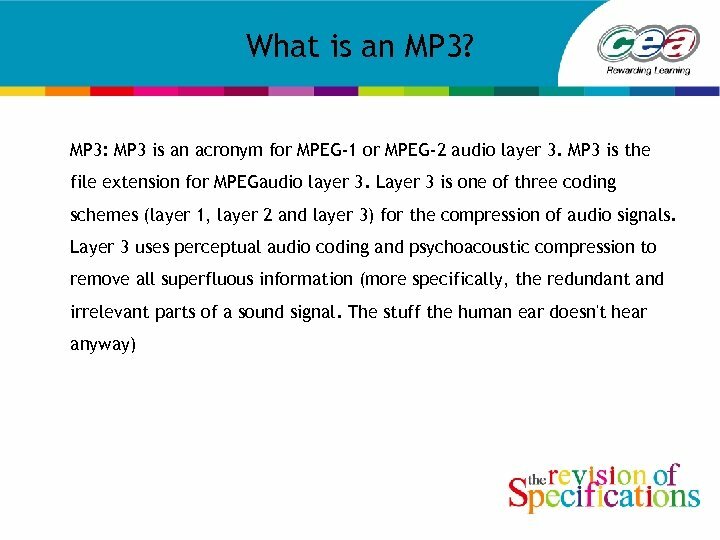 MP 3 This following information is only a guide to on how to operate an MP 3 player – each machine will have its own specific features. 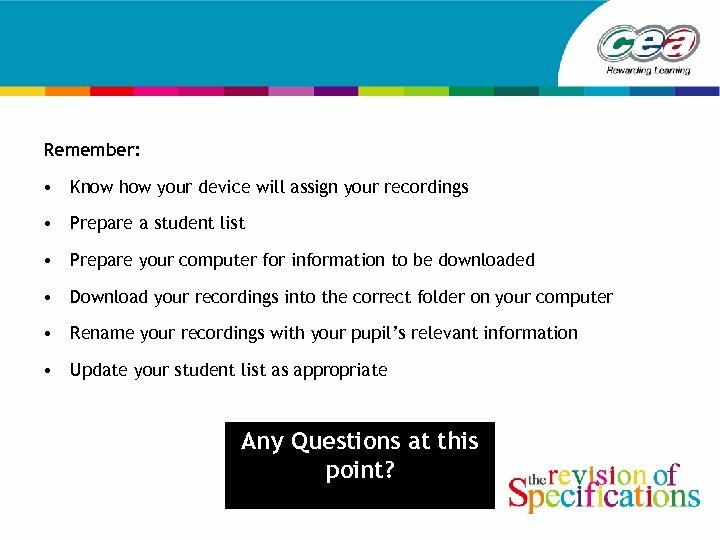 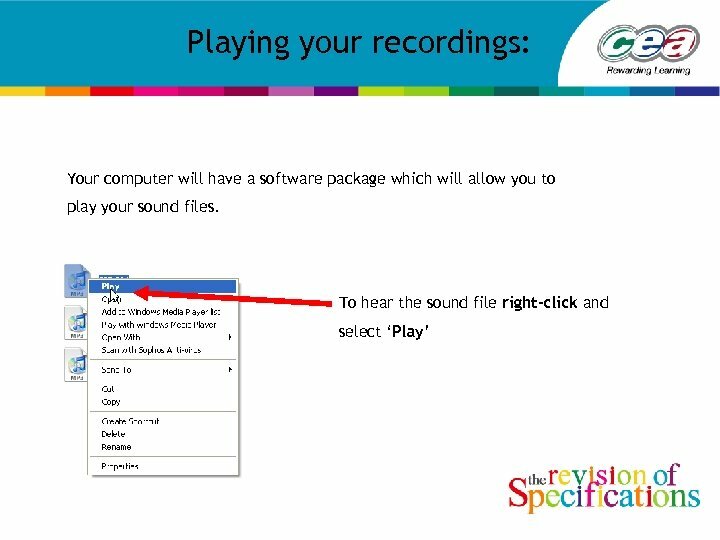 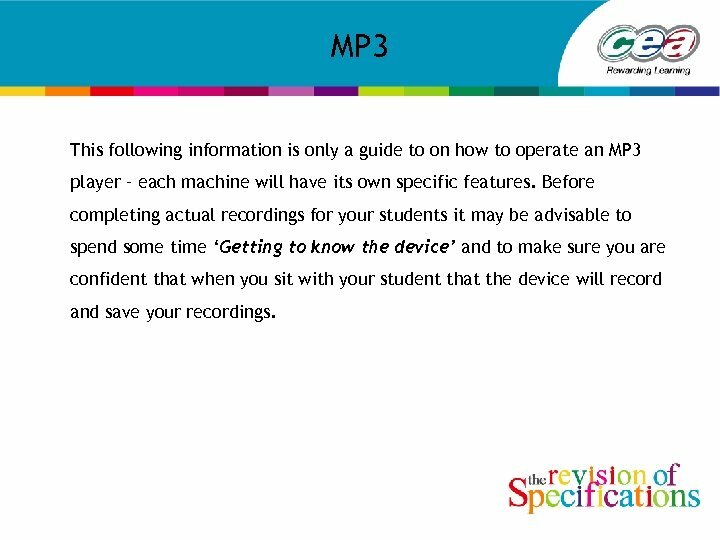 Before completing actual recordings for your students it may be advisable to spend some time ‘Getting to know the device’ and to make sure you are confident that when you sit with your student that the device will record and save your recordings. 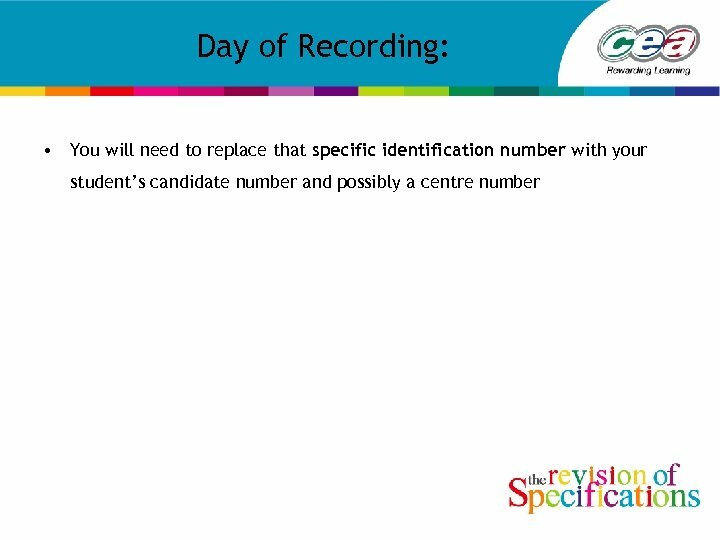 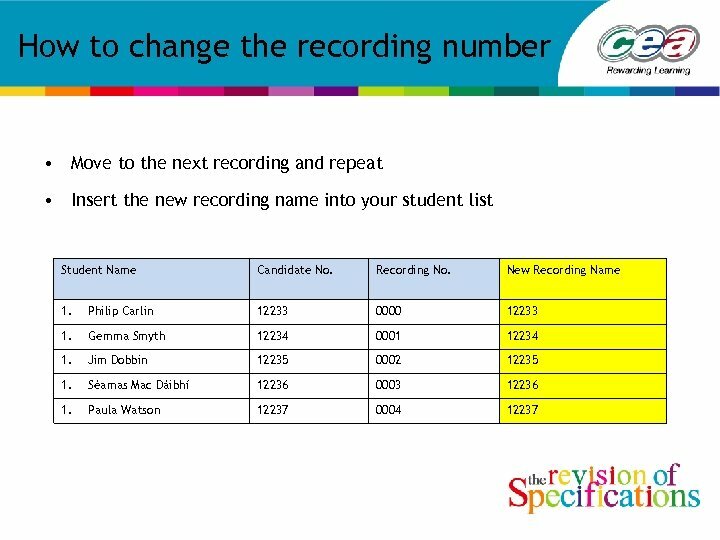 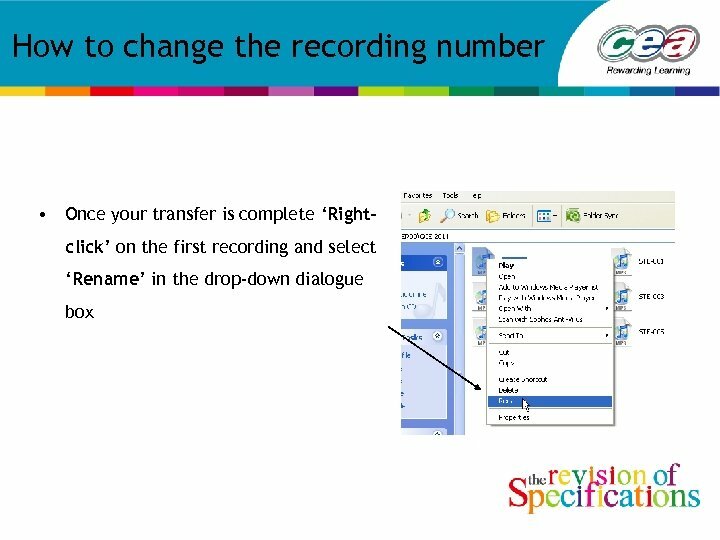 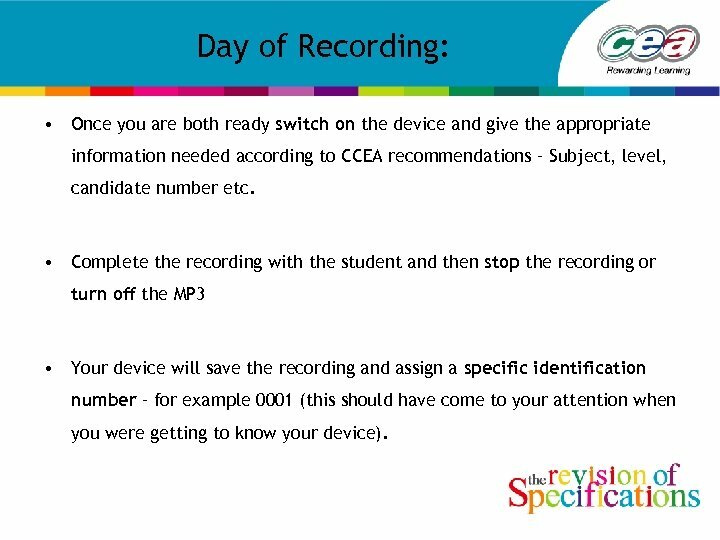 Day of Recording: • Once you are both ready switch on the device and give the appropriate information needed according to CCEA recommendations – Subject, level, candidate number etc. 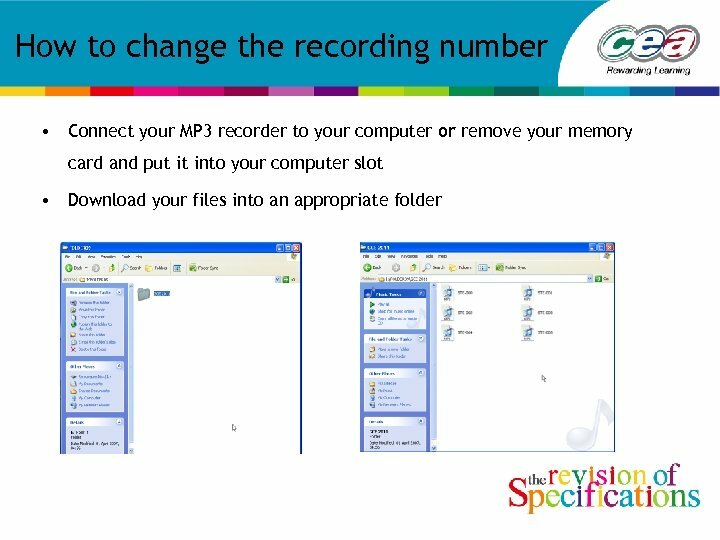 • Complete the recording with the student and then stop the recording or turn off the MP 3 • Your device will save the recording and assign a specific identification number – for example 0001 (this should have come to your attention when you were getting to know your device). 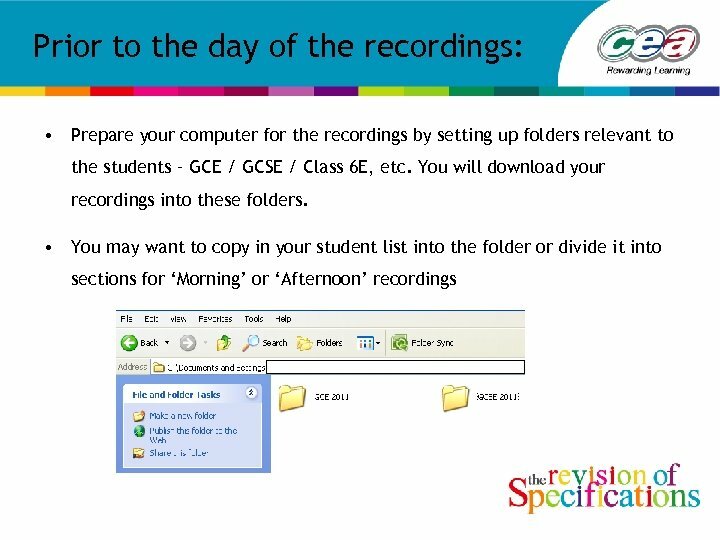 Remember: • Know how your device will assign your recordings • Prepare a student list • Prepare your computer for information to be downloaded • Download your recordings into the correct folder on your computer • Rename your recordings with your pupil’s relevant information • Update your student list as appropriate Any Questions at this point? 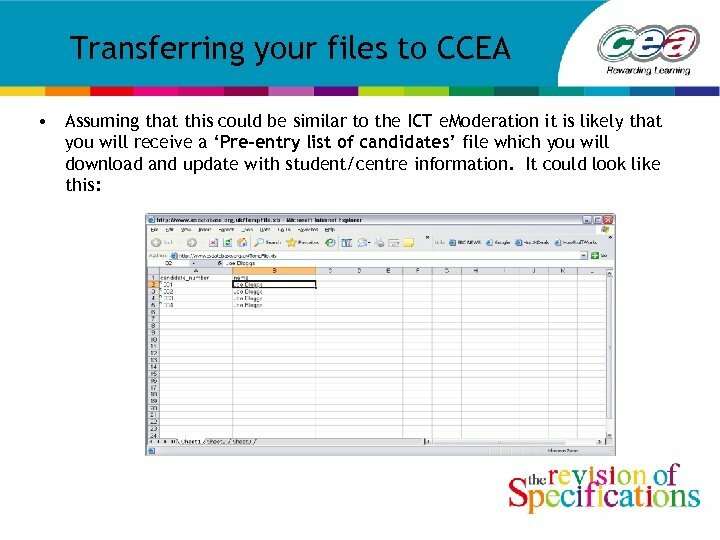 Transferring your files to CCEA • The following information is only a guide at this time and may be subject to change at any time in the future. 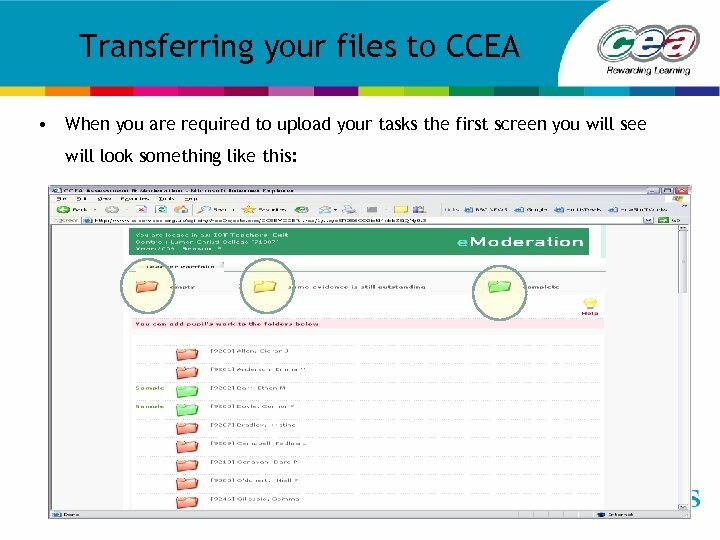 • While the system for uploading sound files to the CCEA secure site is not fully developed yet it is envisaged that it could look similar to the current site used for ICT e. Moderation. 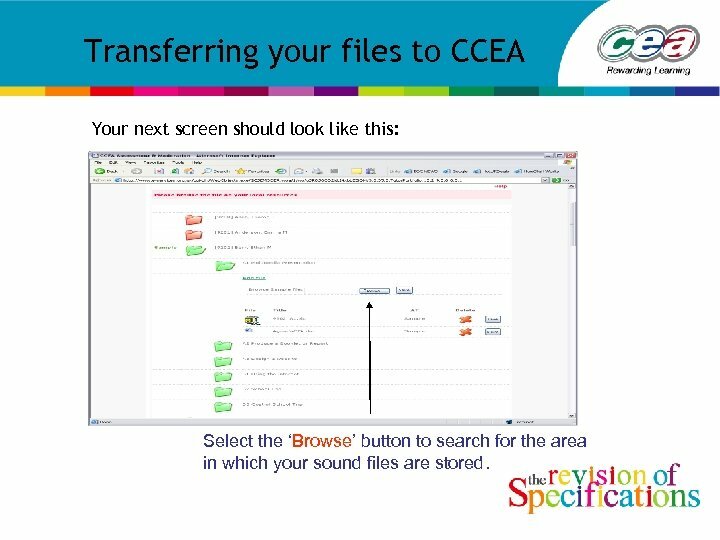 Transferring your files to CCEA Your next screen should look like this: Select the ‘Browse’ button to search for the area in which your sound files are stored. 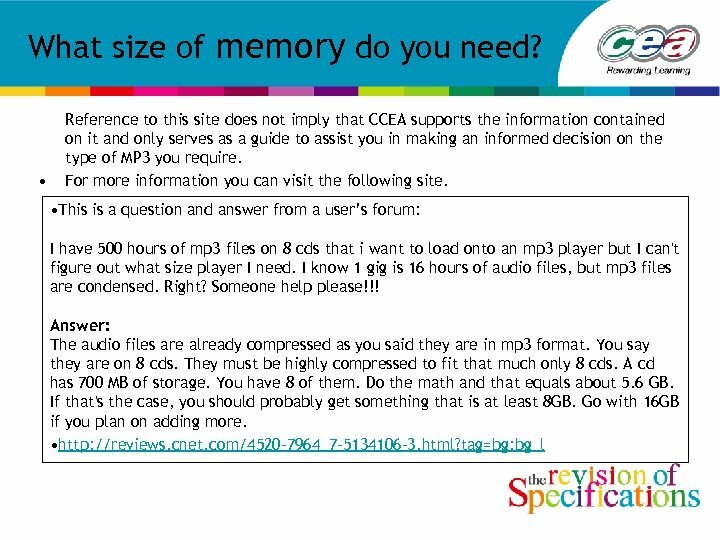 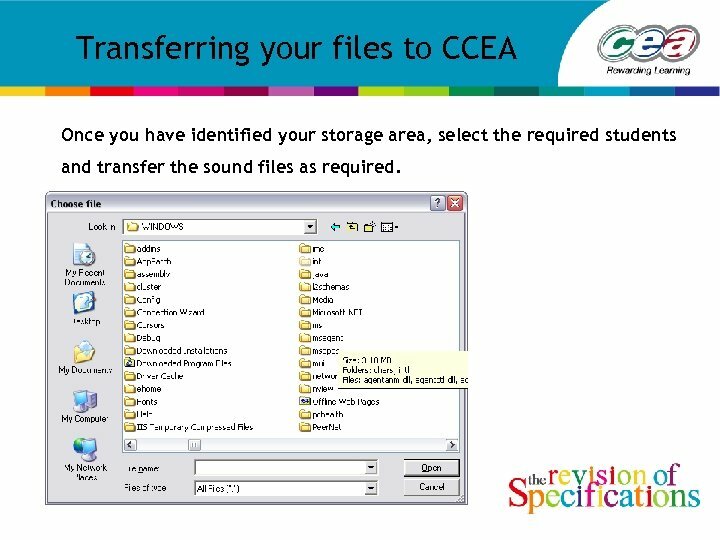 Transferring your files to CCEA Once you have identified your storage area, select the required students and transfer the sound files as required.